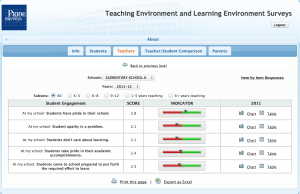 The Pride Teaching Environment Survey provides a context by which whole schools are measured. After undergoing more than three years of psychometric testing of responses drawn from 72,000 teachers, the data produced by this comprehensive school climate survey has been found proven and valid to help school administrators foster an environment of teacher satisfaction and student success. Due to the reliability of our teaching climate and satisfaction survey as a tool for educational leaders to gauge learning conditions, it has been included in the School Climate Survey Compendium of the National Center on Safe Supportive Learning Environments. 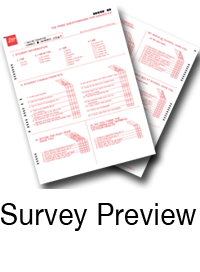 Boasting an in-depth examination of current and upcoming issues in education, our Teaching Environment Survey also covers traditional National Outcomes Measurement System items used in a variety of grants. Plus, with a powerful reporting system and an intuitive electronic dashboard, Pride Surveys helps to take the guesswork out of interpreting your findings. Your e-dashboard will graphically display large, easy-to-interpret data sets in thoroughly-researched and documented scales. 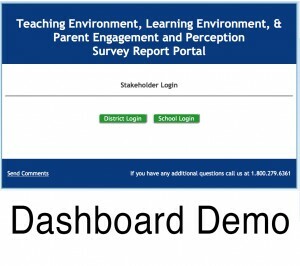 Try a free demo of our exclusive e-dashboard today. To find out more about the Pride Teaching Environment Survey, as well as our full line of scalable survey products, speak with our team today at (800) 279-6361, or check out survey testimonials submitted by professionals like you! Our Teaching Environment Survey can help your school administrators, teachers, and other personnel work together to improve teaching methods – learn more about the many benefits of conducting a school climate questionnaire, or order online now!